Amanda Taylor selfie killer. 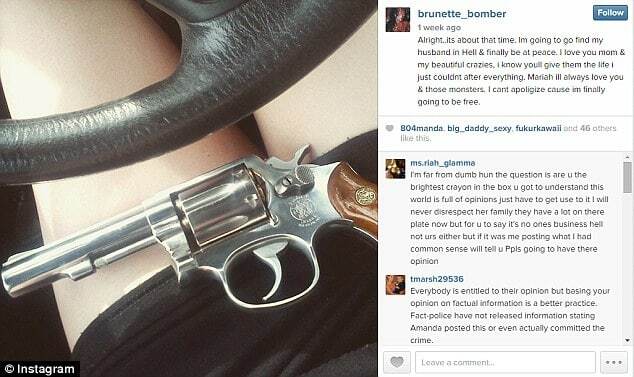 Image the Virginia daughter in law posted after stabbing her father in law Charles Taylor to death. Amanda Taylor selfie killer: A woman sentenced to life for the murder of her father in law has described what motivated her before posting images on social media. 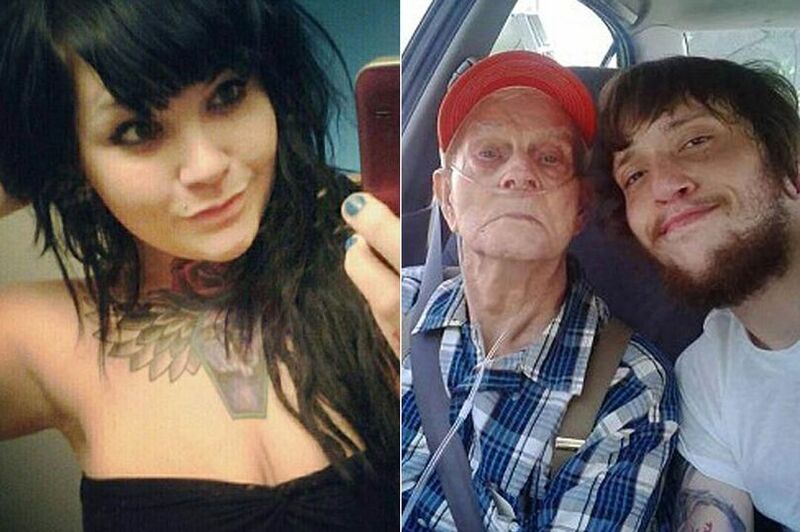 Amanda Taylor a Virginia woman who took a selfie with the body of her father in law after stabbing him to death has told she did so because it made her happy. The admission comes after Taylor murdered 59 year old man, Charles Taylor in April, 2015, repeatedly stabbing the man at his Ellet home. The man’s murder came according to Taylor as retribution after the mother of two’s husband, Rex, took his own life the year before. Having taken the selfie with her victim, Montgomery County Commonwealth’s Attorney Mary Pettitt told during trial proceedings that Taylor publishing the photo on social media before sending it to a ‘friend who runs a serial killer website’. Next, Amanda posted a status on Instagram under her username brunette_bomber alongside a picture of a news report alerting members of the public that she was on the run with accomplice Sean Ball. She even phoned a local reporter and gave an interview reported the mirror comparing the thrill of stabbing to the first time she rode a rollercoaster. The social media updates continued. The crime led to Taylor, 26 being sentenced to life in prison. At the time of her sentencing the woman showed no remorse. Adding, ‘It was just something that made me really happy’. Amanda maintains that she killed her father-in-law in revenge for her husband’s suicide which she blames on him. ‘I just wanted him to feel the pain I felt. That’s the most alive I’ve felt since Rex died,’ she said. On April 4, the daughter in law attacked her 59-year-old father in law in his home with a bayonet-style knife. Describing the killing during the prison phone interview, she said: ‘I was very happy, I was very happy just to finally get all that built-up hate and anger and all those feelings out on him. ‘When I stabbed him I didn’t see anything and he just looked at me and he was like “what are you doing?” and as I was stabbing him, he had reached up and got my hair. ‘Sean’ is Sean Ball, her accomplice who she later turned on while on the run from police. Amanda Taylor selfie killer, pictured victim Charles Taylor with his son, Rex Taylor whose suicide death the widow blamed on her father in law. 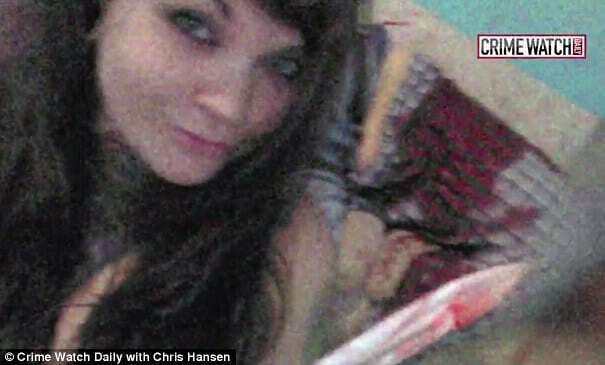 After murdering Charles, Amanda posed for a selfie with his body and the knife she used to slaughter him. ‘I was just really excited and I was like hey I’m gonna take a picture so I can post it and show everyone. It was just something that I, it made me really happy,’ she continued. Despite having an obsession with murder, she said she was surprised by the overwhelming sense of freedom she felt after carrying out the killing noted the dailymail. ‘It was very different than what I had in mind. It’s not what you see in the movies. ‘All the nerves and the feeling of like freedom and that’s how I felt,‘ she said. From there, Taylor told of trying to contact ISIS before her arrest only to never receive a response. The woman insisted she did not want to join the terror group with which she had a ‘weird obsession’. ‘I wasn’t trying to join ISIS. I wasn’t going to go blow anything up in the name of, you know. I had this weird obsession with it for a minute and I tried to reach out but obviously nothing happened from it,’ she said. Crime Watch Daily also obtained a copy of one of the first police interviews she gave after being arrested. During the interview, Taylor described how she’d aimed for her father-in-law’s chest while stabbing him and revealed that she barely got any blood on her own clothes because the knife was so long. Sean Ball was jailed last year for 41 years after admitting second-degree murder in a plea deal reported the Roanake Times. A 60 year jail sentence was suspended save for Ball having to serve 41 years and one month. The plea had come two weeks after Judge Marc Long upheld a jury’s recommendation that Taylor receive a life sentence for her part in the slaying of Charles Taylor whom she blamed for her husband, Rex’s suicide death. Rex Taylor hung himself in August 2014. He had been using drugs which his widow believes his father introduced him to as a teenager. The latest revelations come after trial testimony pointed Amanda Taylor having a troubled life with two stints in a psychiatric facility and anger issues growing up. Amanda Taylor selfie killer- at the time of her arrest in 2015. 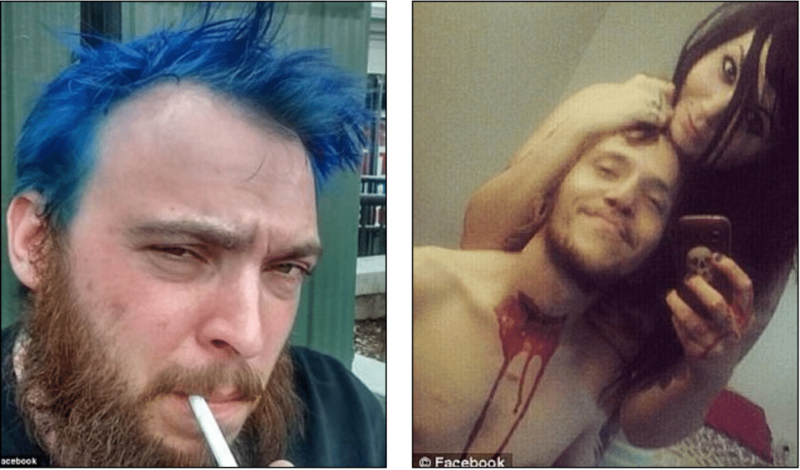 Amanda Taylor selfie killer: pictured Sean Ball left and Taylor with her husband with whom she shared a macabre fascination for murder.